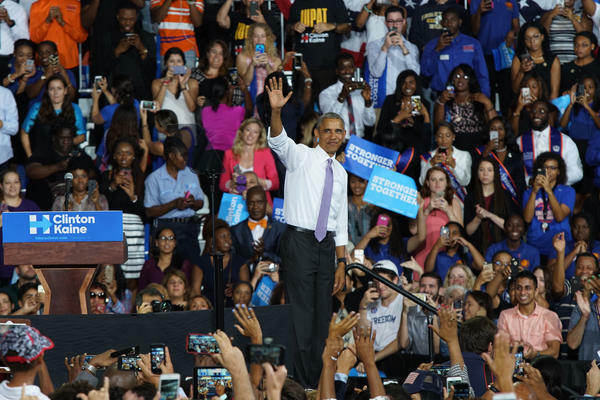 President Obama said this is probably his last visit to South Florida as president. "But I will come back and it will be more fun," he said. 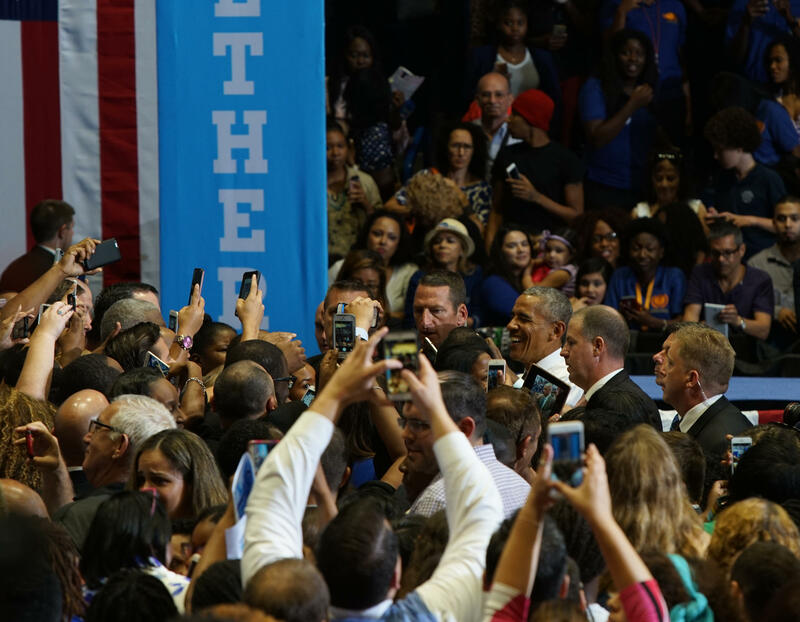 Hundreds of people came close to the stage trying to shake president Obama's hands at the end of the rally in Miami Gardens. 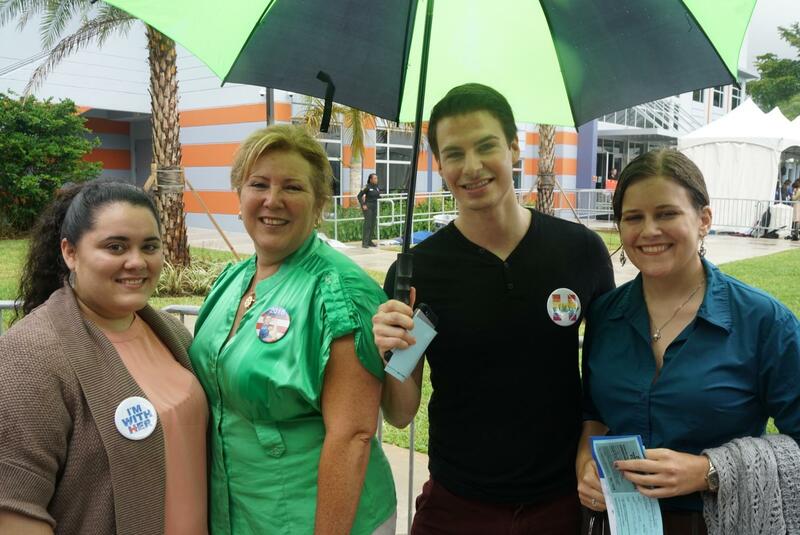 Thainy Diaz (left) huddled under a green and black umbrella with her mother and friends, while they waited to get into the FMU Arena. After a more formal speech at Miami Dade College dedicated to defending the Affordable Care Act, Obama took off his jacket, rolled up his sleeves and concentrated on attacking Republican candidates Donald Trump and Marco Rubio while emphasizing how electing Hillary Clinton and Patrick Murphy will give continuity to his policies. "Progress doesn't stop with my presidency. 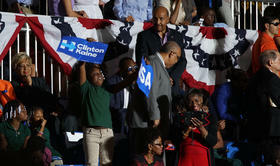 We are just starting," said Obama to the crowd gathered in Miami Gardens. "But all that progress is at stake if we don't do things right in this election." And if there was any doubt about what, in Obama's eyes, is the right course of action, he said: "Donald Trump wants to reverse progress. Marco Rubio wants to help." "Florida, your vote matters," said the president at the rally. When the crowd booed at the mention of Donald Trump, he said: "Don't boo, vote." That particular line resonated with Jeff Noel, a born-and-raised Miamian and community organizer who squirmed his way to the front of the crowd. "I'm fascinated when he says, 'Don't boo, vote.' I was just waiting for that line," Noel said. 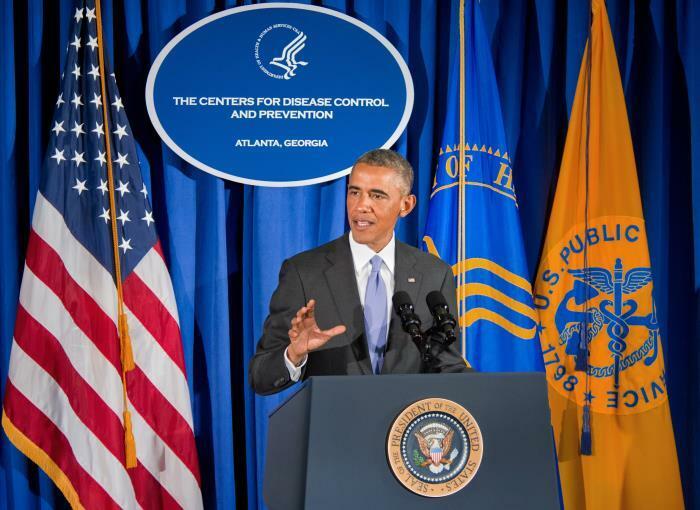 "Whether you're a Republican or a Democrat or you're nonpartisan, it's true. It's true. If you want to make a change, want to make a difference in this society, then you have to vote." Obama was fiery in his defense of the Democratic candidates in Florida, singing the praises of Hillary Clinton and U.S. Senate candidate Patrick Murphy, but parts of his speech were nostalgic, with references of this being his last visit as president. "His presidency was more about us than him. And I will miss that, because not every candidate that runs is all about the people. 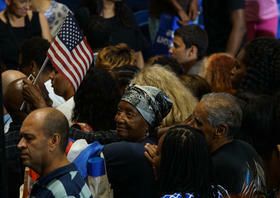 Sometimes they’re all about them,"said Shawn Thomas, Miami resident, after hearing the President's speech. The program included a speech from Congresswoman Frederica Wilson, who asked the crowd to chant with her: "Fired up, ready to go, Fired up, ready to vote." "Donald Trump says to vote for him, what do you have to lose? Let me tell you," said Wilson. Murphy was also in attendance. 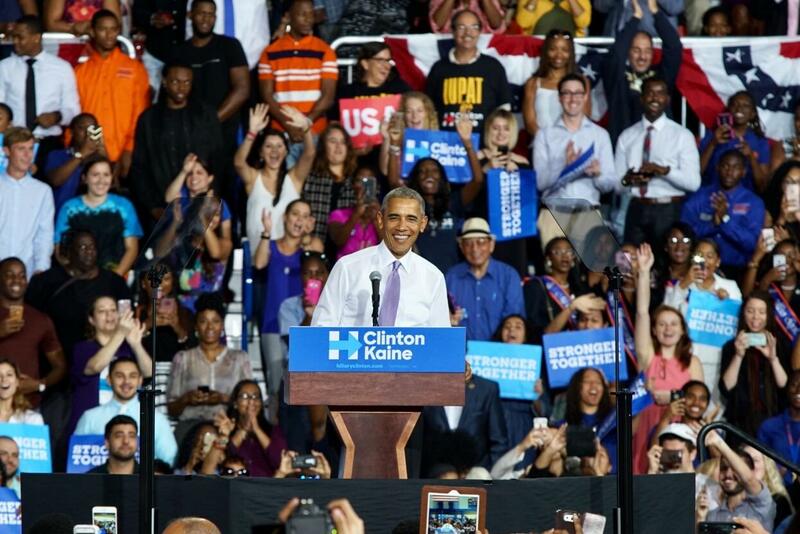 In his speech, he asked the crowd to vote to preserve the legacy of President Obama. Oliver Gilbert, mayor of Miami Gardens, welcomed those in attendance to the city and said: "We tore down the White Only sign at the White House. In this election, we are tearing down the Men Only sign". The rainy afternoon didn't dampen the spirits of the participants.
" I am here because this is the last time that he [Obama] is here as president," said Jean Johnson, who stood with her mom in the rain for almost half an hour to get into the Arena. Thainy Diaz was also in line with her mother and friends, all huddled under a big green and black umbrella. "I am going to miss the Obama family giving us hope," she said. President Barack Obama has postponed his appearance at the University of South Florida in Tampa on Wednesday because of Hurricane Matthew.